On Sept. 12, a new cease-fire took effect in Syria. With a lull in fighting, some are hopeful for an end to the nation’s ongoing civil war. Yet, even if the war ends soon, rebuilding the country will take time. As many refugees anxiously wait and hope for peace and the opportunity to return to their homeland, the U.S. government has revised its position on refugees. This week, the Obama administration announced that it plans to accept 110,000 refugees from around the world in 2017, a 57 percent increase. This comes after the U.S. met its goal in August of settling a minimum of 10,000 Syrians in 2016, as part of its commitment to do more for Syrian refugees. Others have lamented there were too few Christians among the settled, and that the Obama administration is biased and supports the entry of Syrian refugees at the expense of reforming the nation’s resettlement policies. Writing about Syrian resettlement in April, I asked, what are the chances that a refugee might become your next-door neighbor? With only about 2,000 refugees settled through 2015, the odds were low. But what do the numbers mean now? Has the increase in the number of Syrian refugees bound for the U.S. and settled in recent months compromised the vetting process? Erik Prince, former CEO of the military contractor Blackwater, argued, “The U.S. government has very little idea where refugees are coming from” and cannot protect the nation from acts of terror. Nevertheless, vetting continues to follow a strict system that includes two stages of interviews that begin with the United Nation’s High Commissioner for Refugees. The UNHCR determines a refugee’s status according to the Geneva conventions by collecting a variety of personal and biometric data. Those refugees who have completed their screening are referred to the U.S., where the Department of Homeland Security conducts a second round of reviews and interviews that often take several additional months. The increased numbers of Syrians settling in the U.S. have not changed the chances that a refugee will be settled next door. 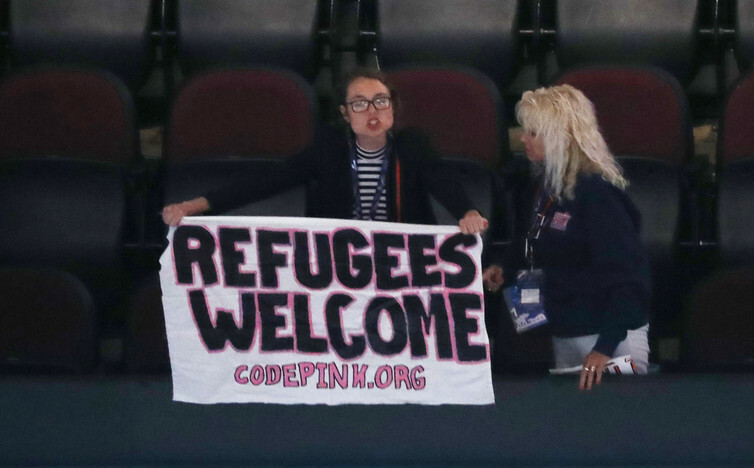 A protester holds up a sign reading ‘Refugees Welcome’ at the Republican National Convention in Cleveland. Last year, Syrian refugees represented less than 0.0007 percent of the nation’s population. There are more Syrians in the U.S. today, but the total remains low at about .003 percent of the nation’s population. If the U.S. government reaches it goal of resettling 110,000 refugees from throughout the world in 2017, it will still represent no more than .04 percent of the nation’s population. Syrian refugees cannot request to settle in the U.S., and those who complete their screening are not randomly dropped into a town. The U.S. government works with community programs and leaders, as well as nine agencies including several that have strong religious ties, such as Church World Service, the Hebrew Immigrant Aid Society, Lutheran Immigration and Refugee Service and the U.S. Conference of Catholic Bishops, to foster integration. These groups support Syrian refugees and help them to find homes, learn English and gain work. There is a fear that the settlement of 10,000 Syrian refugees will lead to an increase in violence, criminal activity and terrorism, and many critics argue the U.S. must limit access. Donald Trump called for “extreme vetting” in August. Others fear that beyond the dangers of violence, the settlement of so many refugees will drain state and federal funds and limit the ability to address other important programs. The Center for Immigration Studies estimates that Middle Eastern refugees settled in the U.S. cost the government on average US$64,370 over five years. Yet, as reporting from US News and World Report points out, refugees do not get long-term support. Upon arrival, refugees receive support that includes a rent voucher and a stipend of $1,000. Refugees need support and aid as they adapt to life in the U.S. But that support is not endless. It is usually earmarked and often originates in private donations including the Partnership for Refugees or donations made in kind, and can range from educational assistance for youth to job training and physical therapy. Public and private programs are organized to support refugees and foster their independence. Children find opportunities to continue their educations. Older Syrian refugees have an opportunity to return to the jobs they held before the civil war. Focusing on violence and terror drives xenophobia and resentment but does little to change the status quo. It also misrepresents the refugees who have settled in the U.S. The vast majority of refugees, Syrian refugees included, are peaceful and looking forward to integrating into U.S. society. In 2015, the Obama administration acknowledged that the U.S. could effectively settle more Syrian refugees. In August, the 10,000th Syrian refugee arrived. I believe the U.S. has a unique opportunity to safely settle more Syrian refugees as part of a united response to the country’s ongoing civil war. Time will tell whether the current ceasefire will lead to a lasting peace and allow Syrians to rebuild their lives and contemplate a return to their homeland.